I had quite the battle with Mom yesterday over drinking water - she didn't wanna. The cardiologist specifically told her that she had to have at least 64 oz of water by 2 pm. Water is very very necessary for everyone but no one more than a senior citizen who borders confusion - dehydration = confusion. And, I've seen the correlation 1st person. Here's an article I wrote about the top five reasons of confusion in the elderly - I think I'm going to expand it into a larger article for Squidoo today as it's pretty important. So, Mom does remember the conversation with the cardiologist, but hates to heed the advice. And, the fallout from not heeding the advice is a very confused mother the next day. One way that I've figured out that I can get her to do things is to have her think it's all about me and, well, let's be honest, that is what it's all about! So, I tend to twist things a bit. My latest ploy is to tell her that my doctor said I had high blood pressure from lack of sleep and stress. She hasn't wandered at night since (knock wood someone!). And, she's been much nicer as of late...until yesterday. So, I had Lori over to stay with Mom so I could do some errands and meet up with Bobbi. I was leaving at 1 and coming back at 7 - a huge treat on a Sunday. Mom was remiss in drinking water up until 1 even though I was reminding her (with more fervor each time) until finally I told her that I was calling in at 2 and if that cup wasn't gone, I was going to come home and I wasn't coming home happy. 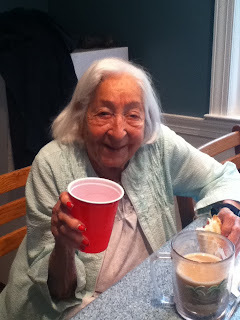 She angrily picked up the cup and started gulping away - hey, I don't really care what the ploy is as long as she drinks. I called at 2 and my angel had downed even more water. When I walked in at 7, she was holding up an empty cup for me to see - perfect. And, we're both reaping the rewards today as she's back to "normal" - whatever that is. 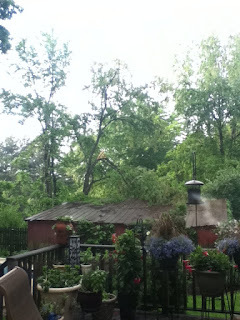 John left for Boston and, of course, another tree came down, this time, right on the old chicken coop. So, my handyman Ben is about to come to the rescue. My new temperpedic bed (king size!) is being delivered today. I'm a firm believer that everyone should have a king size bed - particularly when there are dogs involved in the sleeping arrangement. I bought a beautiful headboard which is not too large as my room isn't all that big. Back in 1857, people must have been littler! Anyway, I can't wait for it to be delivered. My existing queen sleigh bed will be moved into the guest room and my bedroom will once again don a king. Wahoo!